All of these problems can lead to your basement having a damp, humid atmosphere. Most of these problems go hand-in-hand. If you have one, you are likely to have at least one of the others. In this case, it’s important to take a dual approach and resolve the foundation issue as well as resolving crack repair. Fix the underlying issue, and make sure no water can seep through cracks and cause other damage. Unfortunately, it’s usually not as easy as just a crack repair, though. As a home or business owner, it is wise to look for these signs of foundation failure/water damage. 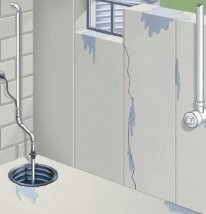 Because of this, it is smart to install or update your waterproofing systems. These are all different tools we can use to help you protect your home or business from future water damage. Because we use only the best waterproofing and foundation repair products from one of the best waterproofing and foundation repair product producers, Earth Contact Products, you can be sure that whatever system or product that we install will last for years to come. So, if you have a damp, humid basement, make sure to call us here at Reliable Waterproofing and Masonry. We have the solutions you need for basement waterproofing in Virginia. Give us a call today for more information on our waterproofing, masonry, and foundation repair services, our service area, or for a free estimate. We are ready to help you in any way we can. Contact us today!